Also someone sugested a substrate filter. Can you help me fill the list with all the required stuff that I need. 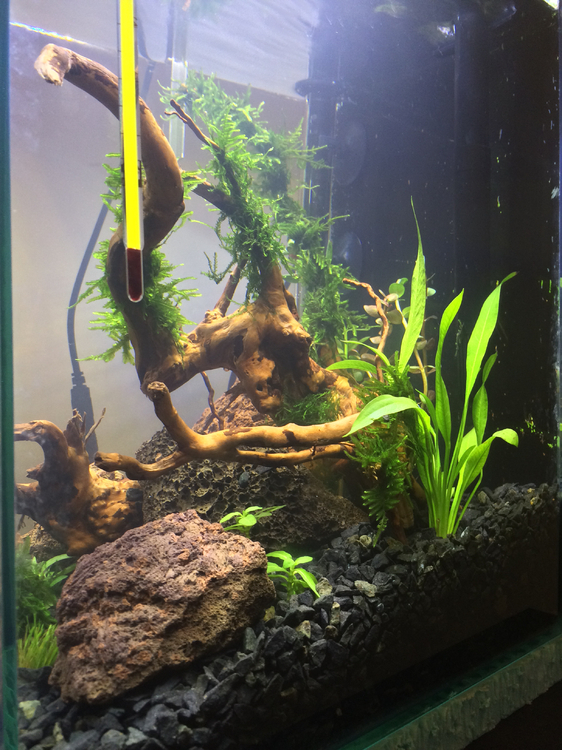 This is my first tank. Anything other then cherry shrimp u will require a means to chill the water come summer to prevent deaths. Just looked up what that tank was, not bad, I don't mind it. Would be ideal for shrimp for sure, nicely planted out. Perhaps just a small internal filter, didn't the tank come with a filter? Did it come with a light? Seeing it's your first tank, stick with Red Cherry Shrimp, they are tough as nails, plus cheap as well. YouTube can help out quite a lot, suss out some videos on new set ups for shrimp or setting up a shrimp tank on there, it'll help a lot. The tank has an internal filter also lighting, I don't know why I've been sugested to add a substrate filter, is it really necesary if it has an internal filter ? I had RCS in mind for start just to see if I can handle then will move up a level :). I know aquascaping is about inspiration and equilibrium so I'm asking if you know a comprehensive article for that matter, there are alot of them out there and for a beginner is hard to choose the right one. Another question that I couldn't find an answer to is, do I need to add bacteria ? also how do I prepare the water, tap water is good or do I need to prepare it with some conditioners first ? If I'm not mistaken, that set comes with one of those PAT Mini internal filters. A lot of people would say you can never have too much filtration but the one it comes with should do the job. Have you got any idea on what kind of aquascape you like? Iwagumi? Dutch? Jungle? Biotope? Nature? I love going out and taking pictures in forests etc. to get inspiration. As for the tap water, you can get away with using tap water and something like Seachem Prime. For fussier shrimp you want to head down the RO water route and remineralise. Oh, you'll love Aokigahara Forest! Yep it comes with PAT Mini, that's why I asked because it didn't seem right to use 2 filters on a tank so small, taking into consideration that I'm a beginner and I will start with easy to grow plants and fish. GotCrabs suggested to go with jungle style and he's got a point, I will experiment a bit with jungle style. Well in my country I don't have a jungle so I'll visualize something out of my head and hope for the best :)). @neo-2FX I saw that you have in one of your tanks Seiryu rock, did you have any problems with it ? it affected your water in any way ? if let's say for example that I don't get all my plants in the same day do I need a separate tank to store them until I have all the plants or ... ? please advise. It most likely will increase pH. I believe it has in mine. My tap water is pretty neutral. It's about 7.8 pH at the moment which is real high for anything except Cherries. I do have some CRS in there but they aren't really breeding much. You can definitely plant later. It's just easier to plant everything initially while the tank only has water up to the soil line. You could always plant the initial lot then later plant the rest. Keep in mind planting later may cause ammonia to go up a bit if you're agitating the soil too much. Which may not be good for shrimp. Good to know, I'm planning on using Seiryu stone with some driftwood for the hardscape. How do I lower the pH level if it will be an issue ? Ok, so I guess I can do it like this, add the plants later on. 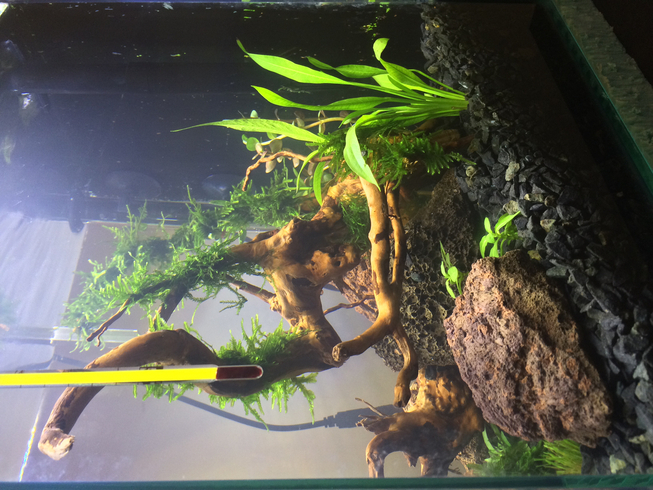 I don't warry about the shrimps because I will not add any until I'm finished with the layout and the tank is fully cycled. I hear that placing the rocks in a bucket of vinegar will neutralize them. Making sure to rinse thoroughly after the soaking. Can always add plants later will just be a bit more difficult. I'll search a bit more about the rocks. Hey guys I've made a list of plants, can you take a look and give me a feedback please ? Also you could add plants to the list. Alternanthera reineckii 'Mini' is a beautful and perfect plant for a nano tank mate, also consider Ludwigia arcuata, a nice coloured stem plant, Rotala rotundifolia also, Hemianthus Callitrichoides as a foreground planted option, also looks amazing, as well as Glossostigma elatinoides. I wonder how similar Eleocharis Parvula is to Eleocharis Belem. Looks very similar from internet photos. 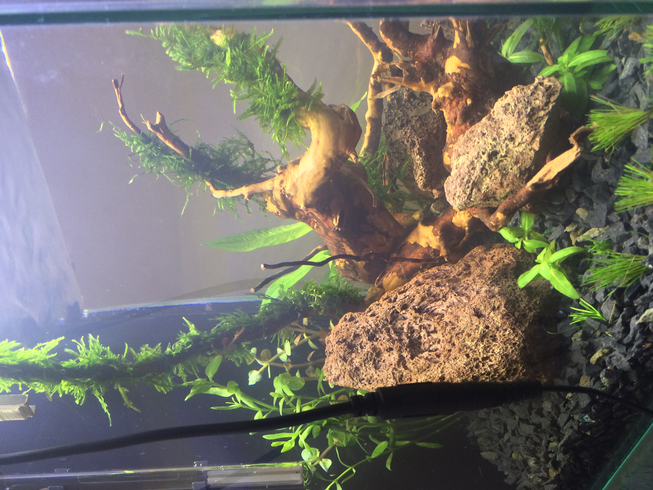 Thanks for the suggestions, from what I've read 'Alternanthera reineckii', 'Hemianthus Callitrichoides', 'Glossostigma elatinoides' requires CO2, they are great looking plants but for my first tank I want to keep it simple, stupid :). I've added Rotala to the list and I will add also 'Ludwigia arcuata'. I hope I will find all of them in my country. seems like the difference is that Parvula leaves curl down, Belem stays erect. Hey guys can you tell me what are the most important water parameters that I need to watch for ? I saw that some are testing for a lot of parameters do I really need to do that or I can to shrink the list ? The water testing kits are expensive here, for a full set I need to pay more than the tank haha. Lots of people have kept AR mini, Glosso and those other plants without CO2. Hmm, that sounds cool, I really like Glosso but I think I will stick with Eleocharis or Marsilea for the carpet. AR mini I will definitely try. I want to get RCS and Red Sakura first and see if it works with them. 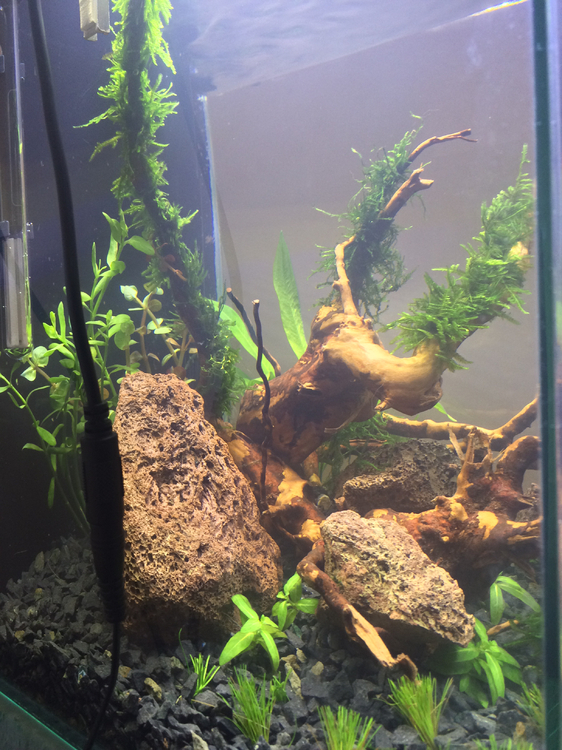 I have Glosso and AR mini out side in a small tank, unfiltered, unheated, natural light, sitting in Fluval Shrimp Stratum, it's going well, CO2 though will obviously help it grow faster, but it isn't needed though, give the AR mini a crack for sure, top plant. Here it is :) any suggestion is appreciated. Thank you @Disciple :). I want to make some adjustments, I have a feeling there are too many rocks and maybe I can add some more species of plants in the background, what do you think ?